Pubius Licinius Valerianus was a man from a respected Roman family, Valerian had held various offices in the government during the reign of Trajan Decius (249-251AD). At the time of the revolt of Aemilian (252-253AD) against the emperor Trebonianus Gallus (251-253AD), Valerian was summoned to bring his army drawn from garrisons stationed on the Rhine. Aemilian had marched on Italy much faster than Valerian or Gallus had expected. Gallus marched out to meet Aemilian but was murdered, along with his son, by his own troops. Despite the fact that Aemilian gained the support of the senate, being an ex-consul and senator himself, he failed to win the support of his own troops. As Valerian marched on Italy, Aemilian was also murdered by his own troops leaving Valerian the undisputed contestant to the throne. Valerian almost immediately raise his own son Gallienus (253-268AD) to the rank of joint Augustus. However, the turmoil of the period proved too overwhelming and his reign marks the beginning of a massive decline in the monetary system of the Roman Empire. The reign of Valerian was marked by numerous frontier disturbances. In 256 AD, Valerian departed Rome for the East in order to deal with the rising threat from Persia. Valerian established his headquarters at Antioch in Syria and mounted his campaign against the Persian from this base of operations. In 257 AD, he appears to have won a great victory, at least according to his coinage. For it was at this time that Valerian took the title “Restorer of the World.” At the same time, Gallienus was waging his campaign on the northern frontier against the Germans. Despite his initial success, in 260 AD, Valerian attempted a major assault taking his legions through Mesopotamia. In a tactical error, his legions were surrounded and the emperor Valerian was taken prisoner. 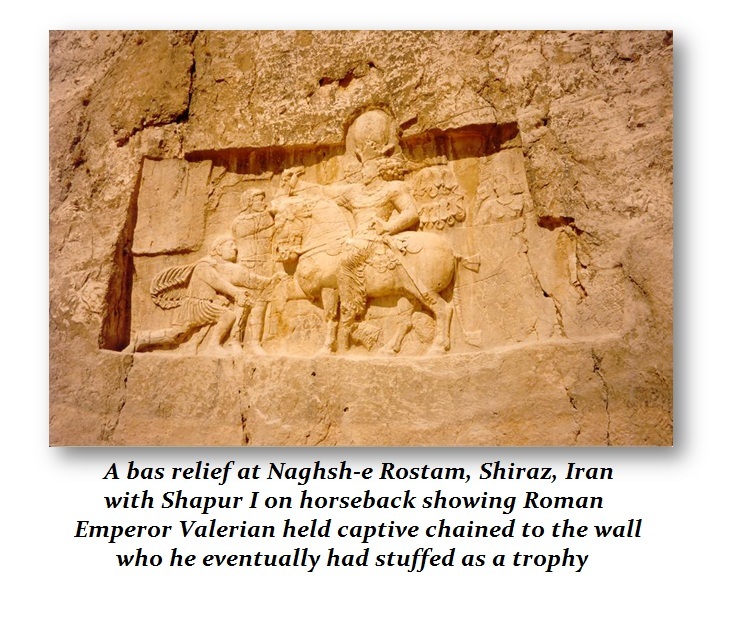 Valerian was turned into a royal slave made to be the foot stool for the Persian king Shapur I. This mural still survives showing Valerian pleading for mercy before Shapur I. Eventually, Valerian was stuffed as a trophy upon his death. In the autumn of 260AD the dreadful message of Valerian’s capture by the Persians reached his son Gallienus in Rome. Gallienus had always been unpopular among the military leaders and with his father gone, rebellion was in the air. Gallienus was besieged on every front. In late 260 AD, the capture of emperor Valarian left the defenses of the east in complete turmoil. Antioch fell to the advancing Persians. Then two Roman generals, Macrianus and Callistus, rallied what was left of Roman troops and defeated the Persian king Shapur at Corycus, halting his invasion forcing him to withdraw back behind the Euphrates. There was no effort to rescue Valerian. Then Macrianus decided the time was right to challenge Gallienus’ rule. He nominated his two sons, Fulvius Iunius Macrianus and Fulvius Iunius Quietus, as emperors of the east, with Antioch as their capital. This rebellion won widespread recognition in Syria, Egypt and Asia Minor (Turkey). They were defeated, but this clearly prevented any rescue effort to save Valerian from dying in captivity. IMP . C. P . LIC . VALERIANVS AVG. IMP. VALERIANVS F . AVG. Note: The obverse portrait styles for double aureii, antoniniani and dupondil are distinguished by a radiate crown. All other denominations display a laurate bust. Note: The coinage of Valerian reflects the serious economic difficulties during his reign. The high cost of defending the empire had taken its toll and there is no better record for that than the coinage of the empire itself. Both the gold and the silver coinage reflects the great difficulties during this period as hyper-inflation would dominate the economy during 8 years post-capture of Valerian. During the reign of Valerian, we see moderate debasement, but nothing drastic. The weight of the gold coinage varies so greatly, that at first glance it would appear as if there were no monetary standards whatsoever. The gold coinage is both irregular in size and weight reflecting the rising cost of government maintaining its defenses. The range in weight for the gold coinage varies from as little as 2 grams to nearly 6 grams. It is clear that a double aureus was maintained, first being introduced by Caracalla (198-217AD) briefly, and more formally by Trajan Decius (249-251 AD). However, specimens of the double aureus (as illustrated here) show a weight of 5.29 grams on average. This is slightly less in weight compared to the double aureus of Trebonianus Gallus (251-253AD) at 5.67 grams. The aureus itself appears to have declined in weight fairly rapidly from 3.25 grams down to 2 grams. 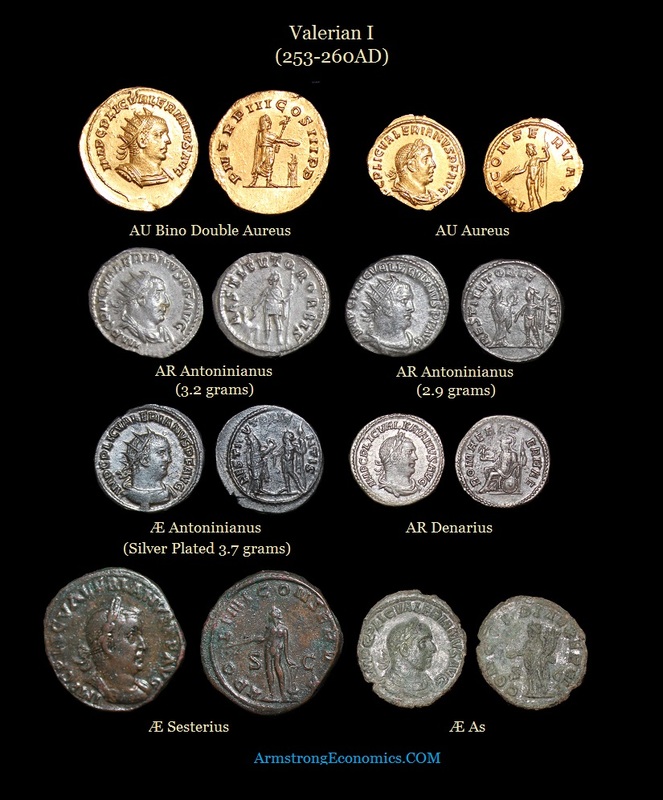 The wide variety in weights recorded by Roman Imperial Coinage reference, suggests that the decline in the monetary system was extremely rapid with perhaps the weight being reduced virtually monthly. The silver antoninianus begins with a weight of about 3.5 grams. Within the first two years of Valerian’s reign, the weight of this coinage declined below 3 grams. 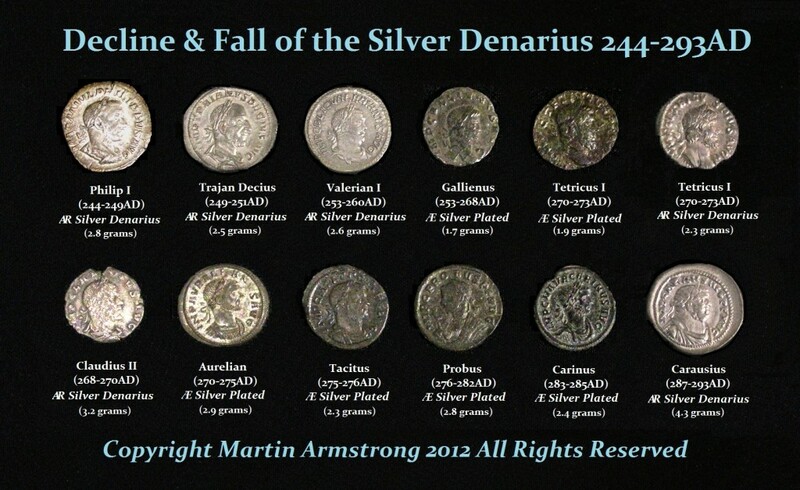 The silver coinage began to decline in weight steadily between 257-258 AD. By late 259 AD, the silver content itself began to declined dropping below 40% becoming a light chocolate bronze coin thinly coated with a silver wash. Ultimately, silver virtually disappeared completely between 262-268 AD under his son Gallienus (253-268AD) and the antoninianus of this later stage had in fact been drastically reduced to the point that the coins were in fact mere bronze imitation thinly coated with a fine silver wash to keep up appearances (much like the withdraw of silver in modern times during the 1965-1968 period). Simultaneously, due to the fact that the once silver antoninianus had become debased to the point of a mere bronze coin itself, the traditional bronze denominations of the sesterius, dupondius and as ceased to be minted. The bronze was being used to coin the much more valuable antoninianus.